Welcome to Online Quants Test in AffairsCloud.com. We are starting Cumulus Course for SBI Clerk 2018 Main Exam and we are creating sample questions in Quants section, this type of Question will be asked in SBI Clerk 2018!!! Data related to number of read complaints and unread complaints by 5 customer care executives(A, B, C, D and E) on Tuesday. Note II: No pending complaints from previous days to be considered for calculation. Data is related to number of complaints received on Tuesday Only. The number of complaints read by B is what percent more than that read by D? Out of the complaints read by B, 60% are from male customers, The number of unread complaints from female customers is 51 less than that of read complaints from female customers, what is the number of unread complaints from male customers? 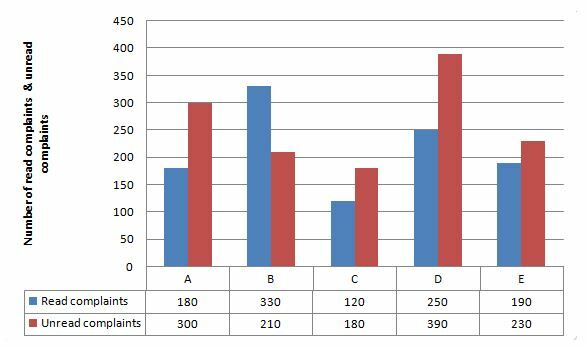 Percentage of read complaints(out of received complaints each of them) were equal for A and G. If the number of complaints received by G is 360, how many complaints were unread by G? What is the average number of all complaints(read complaints + unread complaints) by all the customer care executives? If the number of complaints received by F was 38% more than that by C and number of complaints read by F was 25% more than that unread by him, how many complaints were read by F?